Another week, another chance for me to prove I can't pose when standing near a celebrity. But it's another chance to talk to an ex-professional sportsperson and steal some of their secrets to a happier training life. While I didn't ask him about my sub-40 minute 10K goal (because I've totally done it WOO!) 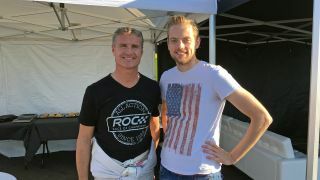 it was great to chat to David Coulthard, one of Britain's most successful F1 drivers, and hear how he balances fitness at 44 with enjoying life living in Monaco. Oh, and if you've not got into the London Marathon this year, read on for a sneak peek at something that might interest you in next week's column. Do you use any fitness technology to stay in shape? DC: I don't. I did all that. But now I don't switch on my Strava before a ride, I don't look at my heart rate - I instinctively know when I'm reaching my flat-line and when I need to back off because I've done it for years. The reason I don't use those tools is because I'm not in competition with anyone. It's not about improving my Monaco to Dolceacqua time because I do that with friends in a social environment. We push each other, we take a lot of breaks and that's it, purely for pleasure. The competitive element in my life is over, I've had all that. I was tested, monitored, checked for my VO2 Max… I've lived that way for such a long time that I don't need to revisit it to feel good. I completely respect that some of my friends do [need fitness tech] and enjoy using it, but that's because they weren't in competitive sport like I was. What advice would you give to someone who didn't train professionally but wants to get the best out of their hobby to get fitter? You've got to pace yourself. You're not in Special Forces training where you're being taken to your breaking point. But it depends on what your goal is. Sometimes you have to accept that someone out there has the same physical capability as you and what's going to make the difference is your mental strength. So if that's what your goal is, you have to take yourself to the point where you've flat-lined, and then how mentally far you can go. If that's not your goal, if it's just about being healthy, then don't take yourself there. You'll break yourself down, break your body down and you might get an injury and you'll stop enjoying it. So I train today for pleasure. When I'm not training I'll drink beer and have a burger, but when I'm training I click into another mode and that's how I balance my work, life and health. The most important thing is to be happy. When I used to be a professional driver, coughing up blood was actually a happy thing because I knew I'd taken myself to a point where maybe my competition wouldn't have done. Today, I don't want to cough up blood. Had bad news this week? Many of us balloted to get into the big ol' London Marathon this week, and most of us will have been left rather disappointed - there's a lot of people going for a small amount of places. So what are you to do if you're still desperately up for running the Marathon? Option one is to get a charity place, but that involves a lot of fundraising (although if you're thinking about it, do it - you've got a long time and you'll be surprised how generous your friends are). But hang on a minute, one darn-tootin', cotton-pickin' minute: what if tech could help you out? What if there was a way to run the race without leaving your house? Over at T3.com we like to give people a good idea of the best gear to get, whether it's running, trail hiking or even just trying to count your steps in town. But the thing is, it's hard to quantify a lot of this stuff. What counts as the 'best' when it comes to choosing the best running shoe? How much does terrain matter? How carefully should you think about the weather? Are we supposed to have one do-it-all trainer or should we have creaking wardrobes full of bespoke options? Let me know in the comments below (or have a word on Twitter) what you want to know about running shoes. Whether it's the importance of gait analysis, the way to choose how much to spend or just how these billion-dollar companies keep refining their models, I'm going to go out and investigate to work out how we should appreciate these things that keep bouncing us from goal to goal.